She's writing out postcards for the international postcard exchange at Playing by the Book. We already received our first postcard -- a picture of a Red Wattlebird. Thanks Ethan from Australia! 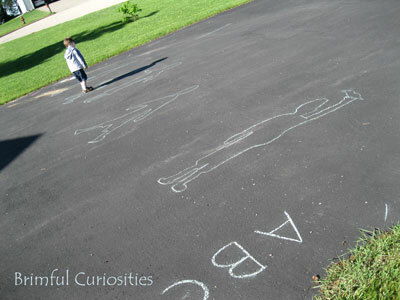 My son's newest favorite outdoor activity... having me capture his shadow outline using chalk. I love the creativity at your house. Both activities sound fun! We did the exchange last year and had a lot of fun with it. It was just in the US, though. 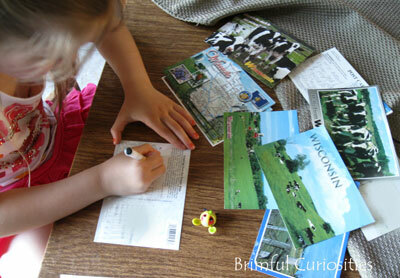 I like the shot of her filling out the postcards- really cute. And the shadow w/ chalk- awesome. I'll have to try that! Nice to hear from you!